Local 1982 of the International Longshoremen’s Association has been holding an informational picket outside Midwest Terminals of Toledo International since the company withdrew its recognition of the union early this year after saying it had received signatures from a majority of union members who no longer wished for union representation. Local 1982 leadership has challenged the decertification to the National Labor Relations Board. But as the dispute wears on, lake pilots have refused to cross Local 1982’s picket line — which has included a boat — in order to maneuver the freighters back to open water, keeping three oceangoing ships at the docks from being able to leave legally. As of May 14, officials said three ships are effectively stuck in Toledo. One, the Federal Champlain, has been held for more than a week, and its arrival in Toledo also was delayed by about 14 hours earlier this month when the pilot then aboard refused to give instructions for docking with the picket boat present. 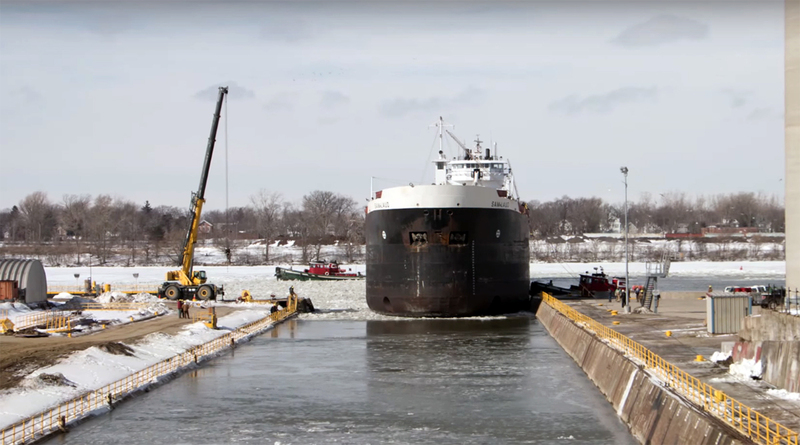 Officials from Fednav, which operates the Federal Champlain and one of the other ships currently stuck in Toledo, did not respond to a request for comment, nor did the Lakes Pilots’ Association. Officials at Midwest Terminals declined to estimate how much the ship delays are costing the port or the ships’ owners. Union leadership has said each vessel is losing tens of thousands of dollars for each day it sits idle in port. Local 1982 and Midwest have been at loggerheads over a labor contract for more than seven years — an impasse tinged by union allegations of racism on Midwest’s part. While other unions represented at the general-cargo docks Midwest operates on behalf of the Toledo-Lucas County Port Authority have mostly white memberships, Local 1982 historically had a mostly black membership. However, the makeup of Local 1982 has changed greatly in recent years. Yockey said in 2013, the union was 95% black. Today, it’s 40% black and 60% white. Local 1982 leaders contend Midwest’s inability to negotiate a new contract with them when it has done so with other majority-white unions is rooted in racial discrimination. The discrimination claim is among a laundry list of unfair labor practice claims Local 1982 has filed against Midwest with NLRB. Among the other issues is the company’s refusal to contribute to a union-sponsored pension plan as provided for in a “master agreement” covering multiple Great Lakes ports. Local 1982 obtained several federal court rulings submitting that issue to arbitration, but Midwest is now challenging the arbitration panel’s makeup because one of its members retired. Meanwhile, Local 1982 has dealt with its own allegations of discrimination. The Ohio Civil Rights Commission found earlier this year there was probable cause that the union had engaged in unlawful discriminatory practices after an investigation into a union dispatcher found he regularly skipped over white members in favor of black members when calling longshoremen in for work. As the standoff has dragged on, so have the tensions. Kapszukiewicz said he has been doing what he can behind the scenes in an effort to find a solution to the dispute. He added it is wrong to describe Midwest Terminals as anti-labor. Even so, Local 1982’s leadership on May 14 accused U.S. Sen. Rob Portman (R-Ohio) of illegally calling on the Coast Guard to intervene in the dispute by waiving the requirement that foreign flagged ships use pilots to move the ships in and out of Great Lakes ports. Federal law dictates that the Coast Guard cannot use its authority to favor one party over another in a labor dispute. The Longshoremen had no documentation to back up that allegation, however, and a spokesman for Sen. Portman rejected Yockey’s characterization, saying the senator’s office had simply been seeking information. Midwest Chief Operating Officer Fred Deichert said May 14 the company had turned to Sen. Portman’s office, as well as that of U.S. Rep. Bob Latta (R-Bowling Green), for assistance in “understanding our alternatives” to resolve the matter. But he also argued that with Midwest considering Local 1982 to be decertified, no labor dispute technically exists, and therefore the Coast Guard would not be intervening in such a dispute if it were to grant a Midwest request for a pilot waiver to allow the three ships to leave the local port. “If a pilot is not available, a ship can be granted a waiver to move on to its next port,” Deichert said, adding as well that the pilots are mistakenly behaving as if there is officially a labor dispute at the port. The ship delays are hurting everyone in the local port, Deichert said, including the workers and port shippers — although he and Midwest President Alex Johnson declined to quantify their company’s economic losses.